What’s In Your Pantry, Emily Jay Berg? What’s in Your Pantry? is a recurring feature where I ask women to tell us more about their food and eating habits by opening up their kitchen pantries to us. This week I’m featuring Emily Jay Berg. Emily is the founder of Matana, a monthly subscription box from Israel. Originally from Toronto, I moved to Israel in 2012 after meeting and falling in love with my [now] husband, Ofir, in India. We got married last summer in an olive grove outside of Tel Aviv, and we welcomed our daughter in 2017. We currently live in a sweet little two bedroom apartment in Jaffa about a 10 minute walk to the sea. When I’m not working, I am usually meeting friends for coffee, exploring the city of Tel Aviv by foot or bike, hiking different trails around the country, or swimming in the Med. I love the pace of life in Israel. Compared to North America, it feels a lot more relaxed and less focused on productivity. Though I’m not religious, I love Shabbat. I love the quiet and the fact that you’re not expected to be online or reachable for 25 hours. We alternate each week between Friday night dinners at Ofir’s grandmother’s (a big, meaty, traditional Yemenite meal) and cooking with friends in the city (lighter and more colourful, seasonal meals of fish, fresh vegetables and hearty grains). We never, ever go out for dinner or order in on Friday nights – it’s all about home cooking, sitting around a table with family, friends, wine and challah. Housing standards in Tel Aviv are quite different from North America. While my friends back in Toronto have proper kitchens (in homes that they own, no less!) with stainless steel appliances, it’s very common here for 30-somethings to have a hot plate and a toaster oven. And so, our current apartment feels very grown up: we have a nice-sized kitchen, a great oven, a gas stove-top and lots of cupboard space. When I open my pantry, I feel very represented by what’s inside – it feels very “me.” There is a mix of Israeli-made products (olive oil, tahini, honey, Dead Sea salt, spices, silan); Canadian treats that I bring back with me after each visit (mustard, maple syrup, raspberry jam, peanut butter); and delicacies I pick-up on my travels (beet borsch mixture from Poland, sauerkraut from Berlin). There are also all of the grains in jars: brown rice, lentils, mung beans, soba noodles, oats, popcorn). I’m not a hoarder or a collector. I hate wasting food and I typically only buy items that I actually consume. I don’t buy more until I have finished what I have. So there isn’t so much clutter in my pantry. I always put grains in glass jars, so that I know when I’m about to run out of something. I display the products with labels that I love, and I keep the staples (things I make almost every day) on the most accessible shelf. 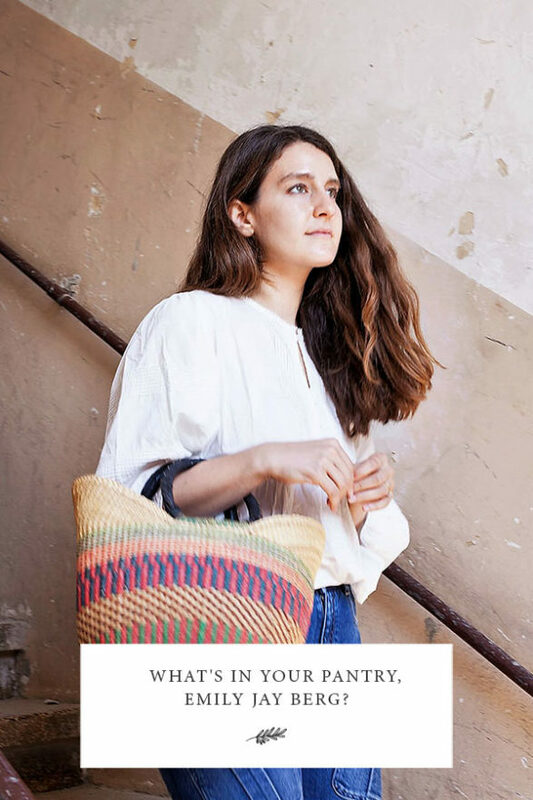 Full disclosure: my company, Matana, highlights Israeli artisans by shipping their products abroad in a monthly subscription box. I have at least one of everything in my pantry right now. My five favourites are: Halva flavoured almond butter made by my good friend Tal of Rusty’s Nut Butters & Treats; organic, cold-pressed olive oil made by a family in the Galil (brand is Rish Lakish); fair trade Za’atar produced by a collective of Arab and Jewish women in the Galilee (brand is Sindyanna of Galilee); apricot jam, made at kibbutz Naot Smadar in the Arava; and hyssop-sun dried tomato spread made by Meshek Ptora. Tahini!! Aka – ground sesame seeds. I always have tahini on hand. Sometimes I get the classic Israeli brands that come in a plastic jar; and other times I spring for the Ethiopian, whole grain variety. I use it in baking, raw as a dip, or turn it into a salad dressing. Ofir’s grandmother makes the best tahini I have ever tasted: it’s super creamy and garlic-y, with a lot of lemon. This weekend, someone actually served me tahini mixed with silan (date syrup), which was amazing. And I love “green tahini” which has parsley or cilantro mixed-in. Almond Butter by Rusty’s Nut Butters & Treats is a semi-guilty pleasure, since it’s super healthy (even though its fattening). They make amazing flavours like cacao-coconut, sea salt and maple … I have to be careful or I will eat an entire jar with a spoon in one sitting, but I will usually spread it on toast. I think some people use it in smoothies or recipes, but it is too precious to be diluted! Guilty-guilty would be the ultimate cliche – Ben & Jerry’s cookie dough ice cream. When I cook, I use very few ingredients. If I am experimenting or making something new, I will look-up a recipe online. I do have the India Cookbook written by Pushpesh Pant, and have used it a few times. When I am at my parents’ house in Toronto, we use Plenty: Vibrant Vegetable Recipes from London’s Ottolenghi and Jerusalem cookbooks; and Barefoot Contessa’s Back to Basics. My sister is a vegetarian and loves My New Roots: Inspired Plant-Based Recipes for Every Season by Sarah Britton. Once, we tricked my dad into eating her kale quinoa muffins. He loved them. It’s actually pretty similar, despite the overwhelming Israeli products. My mother and I have very similar cooking styles, taste in food (and most things). I would say that her pantry had a lot more “old stuff” – she always had baking goods on-hand, and spices that I don’t think have ever been used. She also does not use glass jars and her pantries have grains in bags or boxes that they come in. My cooking style is very simple: I like to use fresh seasonal foods and let the flavours speak for themselves. I don’t use a lot of ingredients, relying on quality olive oil, salt and herbs from the garden. If I could change something, I would add more spices to get more creative with my cooking. Your turn: What food from Emily’s interview do you wish you could try?